Precipitate’s New Geochemical Data | Precipitate Gold Corp.
Vancouver, B.C. – February 27, 2018 - Precipitate Gold Corp. (the “Company” or “Precipitate”) (TSXV: PRG) is pleased to announce details from compiled results and interpretation from the latest geochemical survey at the Southeast and South Jengibre zones located within the Company’s 100% owned Juan de Herrera project in the Dominican Republic. The two neighbouring zones are located approximately six kilometres southeast of the Company’s Ginger Ridge Zones. At the Southeast and South Jengibre zones, new base metal and path finder element anomalies have been delineated through soil sampling and the use of X-ray fluorescence (“XRF”) analysis. This latest work has expanded and refined existing anomalies with new base metal (copper, lead and zinc) soil anomalies. Previous results from Precipitate in these zones included a high-grade copper showing at the Southeast Zone returning a grab sample of 13.5%* copper and trench results of 8.0 metres (‘m’) grading 1.28% copper, including 3.0m of 2.78% copper, and anomalous gold values at the South Jengibre Zone including rock grab samples up to 5.2 grams per tonne gold. The new XRF base-metal-in-soil data provides an additional layer of information about these anomalies when reviewed along with the prior gold and pathfinder geochemical data and induced polarization (“IP”) and magnetic geophysical surveying data generated from these areas. Collectively, these coinciding layers of technical data have elevated the Southeast and South Jengibre zones into high-priority anomalies and emerging future drill targets. See the accompanying XRF data map and Animated Multi-element Anomaly GIF map or the Company's website for the detailed data compilation figures. In the near term, Precipitate plans to carry out detailed geological mapping and focussed continuous rock chip sampling to prioritize drill targets within or around these zones. 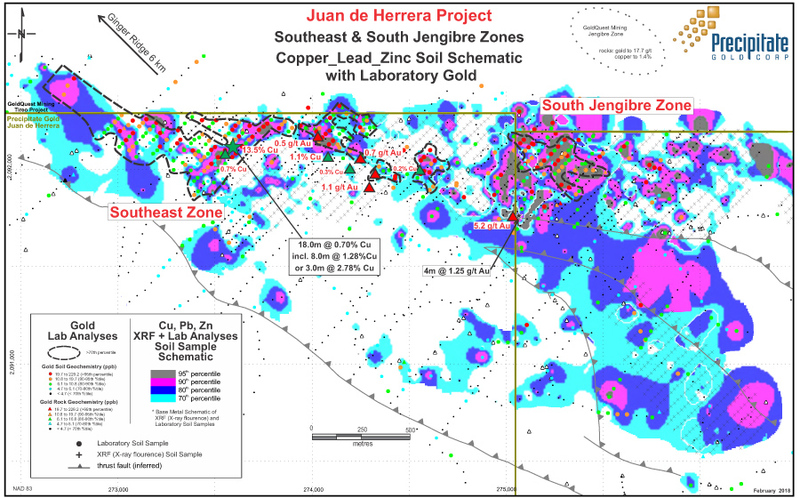 The identification and ongoing refinement of multi-layered geophysical-geochemical anomalies at both the Southeast and South Jengibre Zones substantially expands the scope and scale of the JDH project exploration. Additional potential drill targets are emerging in the Company’s extensive Tireo Gold Camp volcanic rocks on the southern extent of the property, adding to the priority work at Ginger Ridge East. The Southeast, South Jengibre, Peak and Melchor zones host significant new XRF base-metal-in-soil anomalies that require follow up sampling programs to better define the full extent of the anomalies and to vector towards prospective VMS (volcanogenic massive sulphide) and epithermal styles of mineralization in the Tireo volcanic rocks. XRF soil samples were collected at a density of 25 metres by 50 metres and analyzed with a portable XRF analyzer by Company technicians. Portable XRF instruments collect quality base metal and various pathfinder element data, but provide limited precious metal results. All soil samples from this phase of exploration have been placed in secure storage for future work, which may include laboratory analyses, geological review or clay/alteration studies. Prior laboratory soil samples collected by Precipitate and GoldQuest Mining Corp. were collected on a wide range of densities (up to a detailed 25m x 50m) and were submitted to Bureau Veritas (“BV”) for multi-element ICP-MS analysis. Rock and soil samples were bagged, sealed and delivered directly to the BV preparation facility in Maimon Dominican Republic where they were dried, crushed (or sieved in the case of soils) and pulped. Sample pulps were then delivered to BV facilities in Vancouver BC (an ISO 9001 accredited facility) for analyses. Samples were crushed (or sieved) to with up to 80% passing 2mm and split using a riffle splitter (code PRP70-250). An approximate 250 gram sub-sample split was pulverized to minus 200 mesh (74μ). A 15 gram sub-split from the resulting pulp was then subjected to aqua regia digestion and multi-element ICP-MS analysis (code AQ201). Rock sample results with gold greater than 1,000 ppb were subjected to fire assay (ICP-ES finish) analysis (30 g pulp; code FA330-Au). Precipitate Gold Corp. is a mineral exploration company focused on exploring and advancing its mineral property interests in the Tireo Gold Trend of the Dominican Republic. 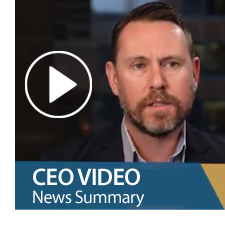 The Company also maintains assets in British Columbia and southeast Yukon Territory, including the Company’s Reef property located immediately adjacent to Golden Predator’s 3 Aces Project in the Upper Hyland River area. The Company has entered into an Option to Purchase Agreement with Golden Predator whereby Golden Predator can earn a 100% interest in the Reef claims by making certain staged payments in cash and shares and warrants. Precipitate is also actively evaluating additional high-impact property acquisitions with the potential to expand the Company's portfolio and increase shareholder value.